Simon's research is in experimental approaches to tackle problems at the Physics & Life Sciences interface. Specifically the application of neutron scattering and reflectivity to investigate a physical basis for the life and death of bacteria and the mechanical and self-assembly properties of viruses. Bacterial resistance to antibiotics has in 2013 been placed on the National Risk Register and we are trying to identify unifying physical principles in the way in which peptides involved in controlling bacterial growth and cell division interact with bacterial membranes and how this is modulated by the cell's metabolic state via membrane potential. Viruses have unique mechanical properties: they have to be strong enough to withstand the stresses involved in reaching their target in a host but fragile enough that disassembly and release of genetic material can be triggered by physicochemical stimulli on reaching the target. We are investigating the physical principles behind this using a combination of high resolution neutron spectroscopy and molecular dynamics simulations. 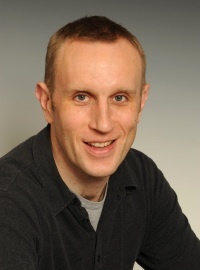 Simon's background is in soft condensed matter physics, having previously worked a range of systems involving polymer functionalized interfaces: Pickering emulsions stabilized by responsive polymer brush functionalized gold nanoparticles; stealth viruses formed from polymer coated Adenovirus; planar gold and sapphire interfaces functionalized with responsive polymer brushes. The current biological physics problems are approached from this soft condensed matter physics background.